Initially, the mestres de capoeira or capoeira masters were a big part of what drew me to capoeira. I really wanted to learn from instructors who knew what they were teaching. Seeing as many mestres easily have over 20 years in capoeira, I was pretty confident they knew their stuff! It was obvious to me, when I started training initially, the importance of capoeira masters. They taught students the art of capoeira from their direct experience and knowledge. From my own previous experiences with break dancing I realized without a proper teacher, it’s a lot tougher to learn. This became even clearer when I realized these teachers do more than just teach movements. They pass down the history and culture of capoeira. They show the students the meaning behind the actions we take, both inside and outside the roda. They were preserving the unique culture that is a part of capoeira. In addition to teaching students the movements and the culture, the masters also help to spread and grow capoeira. In the beginning of the 20th century, capoeira was only located in Brazil. Now it’s found worldwide and continues to grow and evolve due the influence of numerous masters. These mestres de capoeira have each made a significant impact on the world of capoeira and in some way have helped it to grow and flourish. I plan to continue to add more as I learn more about various masters in capoeira. 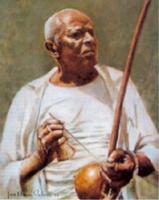 Pastinha – Starting at a young age, Mestre Pastinha eventually became the father of modern day capoeira Angola. 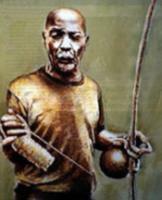 His legacy is seen in practically all capoeira Angola worldwide. Joao Grande – A student of Mestre Pastinha, Mestre Joao Grande spread capoeira Angola to the United States and made New York a Mecca for capoeiristas worldwide. Bimba – Mestre Bimba helped to change capoeira from an illegal activity to the National sport of Brazil. He also created the style of capoeira called Regional. Suassuna – A capoeirista who graduated in Angola and Bimba’s Regional style, Mestre Suassuna brought capoeira to Sao Paulo forming Cordão de Ouro.